Hey if anyone wants a $5 off promo code for the latest fig campaign, Trackless, let me know. They sent the code after I already backed it. Here's a link to the game info, it looks cool. Haven't decided if I'll back either (or both) yet though. So here's a game kickstarter for coolsome. Yes sir, that's professional wrestler Joey Ryan. In a little less than his usual garb. In case anyone isn't subscribed to the Fig newsletter - Pillars of Eternity 2 is being funded currently. I thought the first game was pretty good (though I still haven't finished it actually). I haven't played many of the classics it was based on but I've enjoyed it. I thought Fallout New Vegas and KOTOR 2 were both good games and really experimented with those franchises so I've enjoyed a lot of Obsidian's work. Time to pull out the crowdfunding money again! Would anyone jump on having the whole album remastered and sold in digital and physical formats? We have been working on our project for quite some time and now it's finally live. It's completely new robotic toy controlled via app on your phone or tablet. It's a robot which repeats after user in the form of an attractive bear. Suitable for both genders of all ages. The robot can be also used for learning songs, words etc. We wanted to create something, which will bring kids out of their virtual worlds back to real life. Robot is powered by servo motors and a controller. All the brains of the robot are neatly packaged in our own app for mobile devices. Active Bluetooth connection enables complete control of the robot. App is compatible for users of Android and iOS operation systems. It's that time of the year again! For those of you who don't know AdventureX is a convention dedicated to narrative & storytelling in games. We include a wide range of genres, as long as there's a narrative element. The event runs from November 11-12, at Goldsmith's uni london entry is free and on a first come first served basis. Though this year on request there's a guest list perk that allows Kickstarter backers to have wristbands reserved for them until lunch, at which point they get added back into the pool for free entry. This allows us to help fund the event but also means folks who have chipped in a lot and are travelling a long way know they can get in. We maxed out the venue on Saturday last year so this was the fairest system we could come up with! 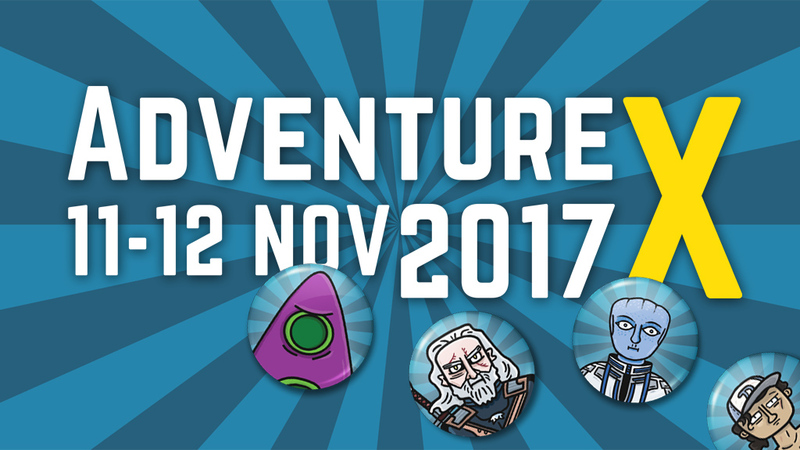 AdventureX is a free event taking place in London on the 11-12th Nov 2017, bringing together developers & gamers with a passion for interactive storytelling. We love graphical adventures; interactive fiction; exploration games; visual novels – just about any game with a great story to tell. Since 2011 we've been inviting gamers and developers from across the globe to share their experiences and exhibit their games. 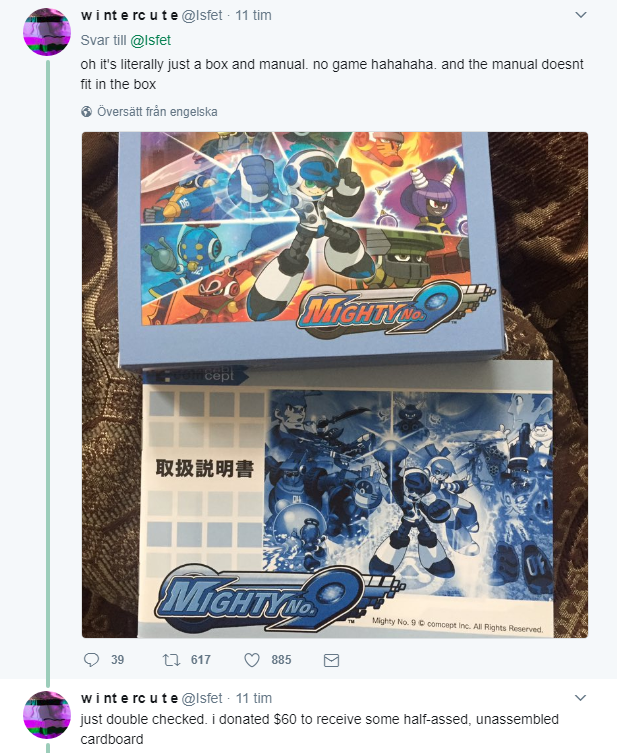 The physical rewards for Mighty No 9 have begun shipping, and........wow. Oh no... That looks just bad. However: I would like to put out that this person seems to look at backing the project as a "purchase", as many other Kickstarter backers do. Yes, the box looks bad. But this person did not "buy it for $60". And in similiar news of great kickstarters, Playdek, the project creators of the utterly failed Unsung Story kickstarter, have decided to just pass all the responsibilities for the project to a new company, instead of owning up to it. I think it's telling that the new company views scrapping everything and starting from the original pitch as the best way forward. That's some serious mismanagement on Playdek's end. Hopefully you'll find this worth checking out and we'd super appreciate your support <3! Now I've gotta catch up on the Amnesia Fortnight doco ahaha. Never downloaded the final cut (if my memory serves me right they /are/ finished and released, yeah?). That looks very interesting, WavingPeople, and I'm glad to see a Linux version is planned. Thank you! I'm a bit gutted that a Linux demo build wasn't made in time... Maybe I should poke the programmer and get him on it, ahaha! Don't worry about it. I've backed the campaign, so if a Linux demo is announced in an update, I'll check it out as soon as I can. I haven't been on here a lot lately, but if any forum folk feel like saying Hi, I'm one of the organisers you'll be able to spot us by our organisers badges/lanyards and the fact we'll be moving at high speed through the conference looking for random missing items. Sounds great. Awesome that you will have streams from it. K'NOSSOS, a Classic Point-and-Click Sci Fi Adventure Game. "K'NOSSOS is a cold surreal adventure game about a man traveling the unknown cosmos, and the things he uncovers on his journey." A Near Dawn, "a stylish humorous thriller blending Point & Click and Visual Novels", needs our help. Only 30 hours left. I have recently backed a nice looking german adventure game name Trüberbrook. The initial goal and first few stretch Goals have already been reached, and the campaign is still running (3 Days left). Additional Stretch Goals include another side chapter, a making of video and audio commentary. The art style looks really nice. They are using photogrammetry on real hand made environments. There is also a familiar face in the video ;-).